The Donbass (Russian: Донба́сс) or Donbas (Ukrainian: Донба́с) is a historical, cultural, and economic region in eastern Ukraine. 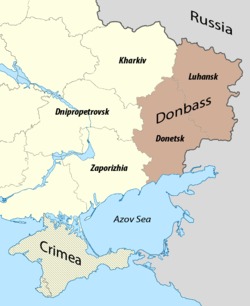 The word "Donbass" is a portmanteau formed from Donets Basin (Ukrainian: Донецький басейн, translit. Donetskyi basein; Russian: Донецкий бассейн, Donetskiy bassein), which refers to the river Donets that flows through it. Multiple definitions of the region's extent exist, but its boundaries have never been officially demarcated. The most common definition in use today refers to the Donetsk and Luhansk oblasts of Ukraine, whilst the historical coal mining region excluded parts of these oblasts, and included areas in Dnipropetrovsk Oblast and Southern Russia. A Euroregion of the same name is composed of Donetsk and Luhansk oblasts in Ukraine and Rostov Oblast in Russia. Donbass formed the historical border between the Zaporizhian Sich and the Don Cossack Host. It has been an important coal mining area since the late 19th century, when it became a heavily industrialised territory. In March 2014, following the 2014 Ukrainian revolution, large swaths of the Donbass became gripped by unrest. This unrest later grew into a war between pro-Russian separatists affiliated with the Donetsk and Luhansk People's Republics, and the post-revolutionary Ukrainian government. Until the ongoing war, the Donbass was the most densely populated of all the regions of Ukraine apart from the capital city of Kiev. Before the war, the city of Donetsk (then the fifth largest city of Ukraine) was considered the unofficial capital of the Donbass. Large cities (over 100,000 inhabitants) also included Luhansk, Mariupol, Makiivka, Horlivka, Kramatorsk, Sloviansk, Alchevsk, Sievierodonetsk and Lysychansk. Now the city of Kramatorsk is the interim administrative center of the Donetsk Oblast, whereas the interim center of Luhansk Oblast is the city of Severodonetsk. On the separatist side, Donetsk, Makiivka and Horlivka are now the largest cities in the Donetsk People's Republic, and Luhansk and Alchevsk in the Luhansk People's Republic. Along with other territories inhabited by Ukrainians, the Donbass was incorporated into the Ukrainian Soviet Socialist Republic in the aftermath of the 1917–22 Russian Civil War. Ukrainian-speaking cossacks in the region were subjected to decossackisation during 1919-1921. Ukrainians in the Donbass were greatly affected by the 1932–33 Holodomor famine and the Russification policy of Joseph Stalin. 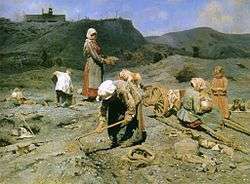 As most ethnic Ukrainians were rural peasant farmers (called "kulaks" by the Soviet regime), they bore the brunt of the famine. According to the Association of Ukrainians in Great Britain, the population of the area that is now Luhansk Oblast declined by 25% as a result of the famine, whereas it declined by 15–20% in the area that is now Donetsk Oblast. According to one estimate, 81.3% of those who died during the famine in the Ukrainian SSR were ethnic Ukrainians, whilst only 4.5% were ethnic Russians. During the reconstruction of the Donbass after World War II, large numbers of Russian workers arrived to repopulate the region, further altering the population balance. In 1926, 639,000 ethnic Russians resided in the Donbass. By 1959, the ethnic Russian population had more than doubled to 2.55 million. Russification was further advanced by the 1958–59 Soviet educational reforms, which led to the near elimination of all Ukrainian-language schooling in the Donbass. By the time of the Soviet Census of 1989, 45% of the population of the Donbass reported their ethnicity as Russian. In the 1991 referendum on Ukrainian independence, 83.9% of voters in Donetsk Oblast and 83.6% in Luhansk Oblast supported independence from the Soviet Union. Turnout was 76.7% in Donetsk Oblast and 80.7 in Luhansk Oblast. The region's economy, however, deteriorated severely in the ensuing years. By 1993, industrial production had collapsed, and average wages had fallen by 80% since 1990. Donbass fell into crisis, with many accusing the new central government in Kiev of mismanagement and neglect. Donbass coal miners went on strike in 1993, causing a conflict that was described by historian Lewis Siegelbaum as "a struggle between the Donbass region and the rest of the country". One strike leader said that Donbass people had voted for independence because they wanted "power to be given to the localities, enterprises, cities", not because they wanted heavily centralised power moved from "Moscow to Kiev". From the beginning of March 2014, demonstrations by pro-Russian and anti-government groups took place in the Donbass, as part of the aftermath of the February 2014 Ukrainian revolution and the Euromaidan movement. These demonstrations, which followed the annexation of Crimea by the Russian Federation, and which were part of a wider group of concurrent pro-Russian protests across southern and eastern Ukraine, escalated in April 2014 into a war between the separatist forces of the self-declared Donetsk and Lugansk People's Republics (DPR and LPR respectively), and the Ukrainian government. Amidst the ongoing war, the separatist republics held referendums on the status of Donetsk and Luhansk oblasts on 11 May 2014. These referendums, viewed as illegal by Ukraine and undemocratic by the international community, returned a result in favour of autonomy from Ukraine. Fighting continued through 2014, and into 2015, despite several attempts at implementing a ceasefire. Ukraine said Russia provided both material and military support to the separatists, though it denied this. The separatists were largely led by Russian citizens until August 2014. Residents of Russian origin are mainly concentrated in the larger urban centers. Russian became the main language and lingua franca in the course of industrialization, boosted by the immigration of many Russians, particularly from Kursk Oblast, to newly founded cities in Donbas. A subject of continuing research controversies, and often denied in these two oblasts, is the extent of forced emigration and deaths during the Soviet period, which particularly affected rural Ukrainians during the Holodomor which resulted as a consequence of early Soviet industrialization policies. Nearly all Jews, unless they fled, were wiped out during the German occupation in World War II. Donbass has a sizeable Muslim community, reaching up to 20% of the population in some areas. According to linguist George Shevelov, in the early 1920s the proportion of secondary schools teaching in the Ukrainian language was lower than the proportion of ethnic Ukrainians in Donbass - even though the Soviet Union had ordered that all schools in the Ukrainian SSR should be Ukrainian-speaking (as part of its Ukrainization policy). Donbass is dominated by heavy industry, such as coal mining and metallurgy. While annual extraction of coal has decreased since the 1970s, Donbass remains an important supplier. Coal mining in Donbass is conducted at very deep depths. Lignite mining takes place at around 600 metres (2,000 ft) below the surface, whilst mining for more valuable anthracite and bituminous coal takes place at depths of around 1,800 metres (5,900 ft). Prior to the start of the region's war in April 2014, Donetsk and Luhansk oblasts together produced about 30 percent of Ukraine's exports. Additionally, several chemical waste disposal sites in the Donbass have not been maintained, and pose a constant threat to the environment. One unusual threat is the result of the Soviet-era 1979 project to test experimental nuclear mining in Yenakiieve. ↑ Hiroaki Kuromiya (2003). Freedom and Terror in the Donbas: A Ukrainian-Russian Borderland, 1870s–1990s. Cambridge University Press. pp. 12–13. ISBN 0521526086. ↑ "Euroregion Donbass". Association of European Border Regions. Retrieved 12 March 2015. 1 2 "The coal-mining racket threatening Ukraine's economy". BBC News. 23 April 2013. Retrieved 18 September 2013. ↑ Hiroaki Kuromiya (2003). Freedom and Terror in the Donbas: A Ukrainian-Russian Borderland, 1870s–1990s. Cambridge University Press. pp. 11–13. ISBN 0521526086. ↑ Andrew Wilson (April 1995). "The Donbas between Ukraine and Russia: The Use of History in Political Disputes". Journal of Contemporary History. 30 (2): 274. JSTOR 261051. ↑ Hiroaki Kuromiya (2003). Freedom and Terror in the Donbas: A Ukrainian-Russian Borderland, 1870s–1990s. Cambridge University Press. pp. 41–42. ISBN 0521526086. ↑ "The First General Census of the Russian Empire of 1897 − Breakdown of population by mother tongue and districts in 50 Governorates of the European Russia". Institute of Demography at the National Research University 'Higher School of Economics'. Retrieved 22 September 2014. ↑ Stephen Rapawy (1997). Ethnic Reidentification in Ukraine (PDF). Washington, D.C.: United States Census Bureau. ↑ Potocki, Robert (2003). Polityka państwa polskiego wobec zagadnienia ukraińskiego w latach 1930–1939 (in Polish and English). Lublin: Instytut Europy Środkowo-Wschodniej. ISBN 978-8-391-76154-0. ↑ Piotr Eberhardt (2003). Ethnic Groups and Population Changes in Twentieth-Century Central-Eastern Europe. Armonk, New York: M. E. Sharpe. pp. 208–209. ISBN 0-7656-0665-8. ↑ "The Number of Dead". Association of Ukrainians in Great Britain. Retrieved 21 September 2014. ↑ Hiroaki Kuromiya (2003). Freedom and Terror in the Donbas: A Ukrainian-Russian Borderland, 1870s-1990s. Cambridge University Press. pp. 253–255. ISBN 0521526086. ↑ Hiroaki Kuromiya (2003). Freedom and Terror in the Donbas: A Ukrainian-Russian Borderland, 1870s-1990s. Cambridge University Press. p. 251. ISBN 0521526086. ↑ Hiroaki Kuromiya (2003). Freedom and Terror in the Donbas: A Ukrainian-Russian Borderland, 1870s-1990s. Cambridge University Press. p. 273. ISBN 0521526086. ↑ Andrew Wilson (April 1995). "The Donbas between Ukraine and Russia: The Use of History in Political Disputes". Journal of Contemporary History. 30 (2): 275. JSTOR 261051. ↑ L.A. Grenoble (2003). Language Policy in the Soviet Union. Springer Science & Business Media. ISBN 1402012985. ↑ Bohdan Krawchenko (1985). Social change and national consciousness in twentieth-century Ukraine. Macmillan. ISBN 0333361997. 1 2 Don Harrison Doyle, ed. (2010). Secession as an International Phenomenon: From America's Civil War to Contemporary Separatist Movements. University of Georgia Press. pp. 286–287. ISBN 0820330086. 1 2 3 4 5 6 7 8 Oliver Schmidtke, ed. (2008). Europe's Last Frontier?. New York: Palgrave Macmillan. pp. 103–105. ISBN 0-230-60372-6. ↑ Kataryna Wolczuk (2001). The Moulding of Ukraine. Central European University Press. pp. 129–188. ISBN 9789639241251. ↑ Hryhorii Nemyria (1999). 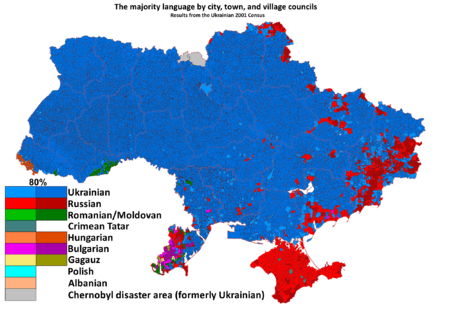 Regional Identity and Interests: The Case of East Ukraine. Between Russia and the West: Foreign and Security Policy of Independent Ukraine. Studies in Contemporary History and Security Policy. ↑ Bohdan Lupiy. "Ukraine And European Security - International Mechanisms As Non-Military Options For National Security of Ukraine". Individual Democratic Institutions Research Fellowships 1994–1996. North Atlantic Treaty Organization. Retrieved 21 September 2014. ↑ Oliver Schmidtke, ed. (2008). Europe's Last Frontier?. New York: Palgrave Macmillan. pp. 102–103. ISBN 0-230-60372-6. ↑ Oliver Schmidtke, ed. (2008). Europe's Last Frontier?. New York: Palgrave Macmillan. pp. 108–111. ISBN 0-230-60372-6. ↑ Leonard, Peter (14 April 2014). 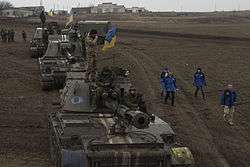 "Ukraine to deploy troops to quash pro-Russian insurgency in the east". Yahoo News Canada. Associated Press. Retrieved 26 October 2014. 1 2 "Pushing locals aside, Russians take top rebel posts in east Ukraine". Reuters. 27 July 2014. Retrieved 27 July 2014. ↑ Panova, Kateryna (8 July 2011). "Illegal mines profitable, but at massive cost to nation". Kyiv Post. Retrieved 18 September 2013.